Teenage Sprintcar prodigy Michael “Buddy” Kofoid is the next ‘next-gen’ superstar to head to Sydney’s Valvoline Raceway with the 16-year-old locked in for a series of races at the iconic Parramatta clayway. 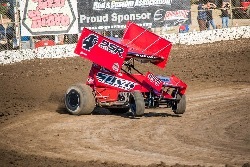 Touted as the next Kyle Larson this remarkable young Californian first caught the eye of car owners and fellow racers when he practiced his 360ci Sprintcar at the incredible age of 9! The story of how his car owner Dan Simpson came to hear of the pint-sized tyro and then watch him practice is now the stuff of legend, but since then Kofoid has proven beyond any doubt that his age is the only novelty factor in the equation. Turning 16 years of age just this week Kofoid has already racked up some impressive race wins and given clear notice that he’s a star on the rise with the ultimate goal of NASCAR and even the possibility of F1! Already an eleven-year veteran of racing in various forms of motorsport since starting at the age of just five the now plucky teenager speaks with a clarity and a confidence that is very reminiscent of fellow Californian WoO superstar Jason Meyers and also Oklahoma jack of all trades now NASCAR emerging star Christopher Bell. At the age of 15 this season he became the youngest ever winner of the Johnny Key Classic in the Civil War Series at Ocean Speedway and he won the Howard Kaeding Classic / King of the West Series. He also became the youngest winner of a 360ci main event at Silver Dollar Speedway. The inclusion of this bright new light in American Auto Racing is another wonderful coup for Valvoline Raceway and Sydney fans will now get to see Kofoid race over the December 26, December 28, December 30 and January 1 race events over the traditionally hectic Christmas-New Year period. Plus, he’ll compete in the 2017/2018 Scott Darley Challenge! Kofoid will bring racing equipment (Maxim chassis and Speedway Engine prepared by Don Ott) owned by Californian cattle rancher Gary Silva and be under the watchful eye of Sydney veteran racer Bernie Gordon (who has had quite a bit to do with Buddy and his family in the last eighteen months) under the Gordon Racing Umbrella owned by USC racer Peter Gordon. Kofoid arrives in Sydney on December 20 and will prepare for his first USC NSW appearance on Tuesday night, December 26.